Display your baby anyway you wish. See More Pictures of different looks. Display your baby or your stuffed animal collection. This is a one of a kind, made by me. Display your baby anyway you wish, cuddled up or swinging. One of a kind hanging cradle, made by me. One of a kind, made by me. Display your Reborn Baby in this 50" Hanging Basket. Display your Reborn Baby in this 60" Hanging Basket. Display your Reborn Baby in this 55" Hanging Basket. Display your Reborn Baby in this Yellow Cream Colored 60" Hanging Basket. Display your Reborn Baby in this Beige 52" Hanging Round Basket. 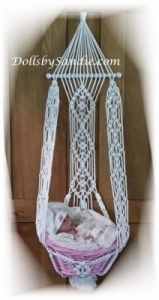 Display your Reborn Baby in this 50" Hanging Basket Cradle. Display your Reborn Baby in this 54" Hanging Basket. Display your Reborn Baby in this 56" Hanging Basket. Display your Reborn Baby in this Rose Colored 62" Hanging Basket. Display your Reborn Baby in this 52" Wall Hanging Basket. Display your Reborn Baby in this 48" Wall Hanging Basket. Display your Reborn Baby in this 55" Wall Hanging Basket with White Stuffed Unicorn. Display your Reborn Baby in this 50" Wall Hanging Basket. With Cloud Soft Bedding for your Baby. with Red Basket for your Reborn Baby. With removable sheer rose covering. Display your Reborn Baby in this White and Soft Green 60" Hanging Basket. with Sheer Lace Top Covering. Display your Reborn Baby in this 52" Ivory Wall Hanging Wicker Basket.